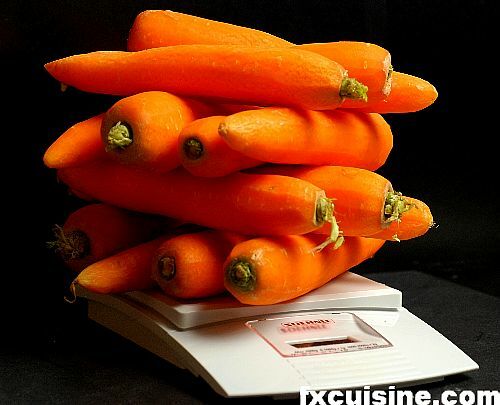 French cops who investigate crimes committed by other cops are nicknamed les boeuf-carottes [beef-carrot], because "When they catch you, they let you simmer forever", as a corrupt cop explains in the movie Les Ripoux. An apt comparison indeed, as this dish, one of the many daubes, used to be left in the hearth to simmer for an entire day. 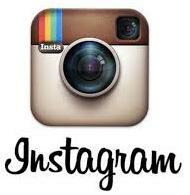 Nowadays, one can prepare amazing daubes in modern eletric ovens. 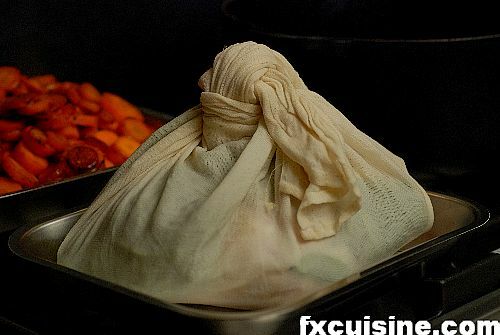 Just lute (seal) your Dutch oven's lid and cook it in the oven for 4 hours slightly above water's boiling point. Let me show you how to prepare this French classic properly. 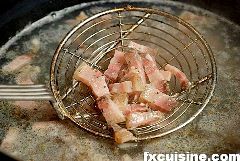 The proper way to prepare lardons (bacon sticks) like a French chef is to put them in a saucepan, cover with water and slowly bring to the boil. 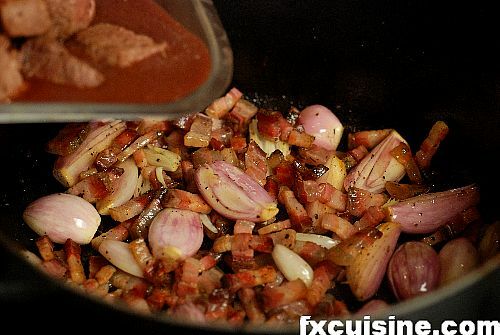 I confess I don't remember why exactly that is done but the explanation was very convincing, something about this process ridding the lardons of a substance that would contaminate the sauce. 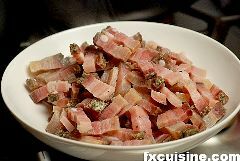 It only takes a couple minutes and as you'll see below, we will get all the taste we want from those lardons by frying them. 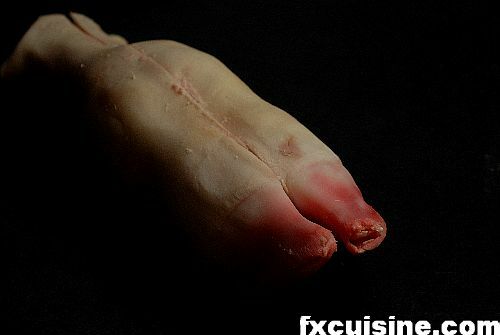 Ah those lovely piggy trotters. 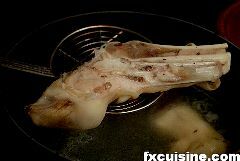 Every ham you have ever bought in your life came with a trotter attached, but nobody buys them anymore. 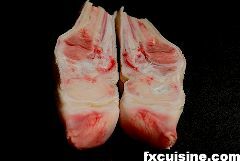 Same for calfs' feet (picture). 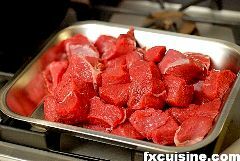 Just ask for your butcher and they'll give them for free and tell their wife at night some guy actually asked for one. The trotters bring gelatin to the sauce. 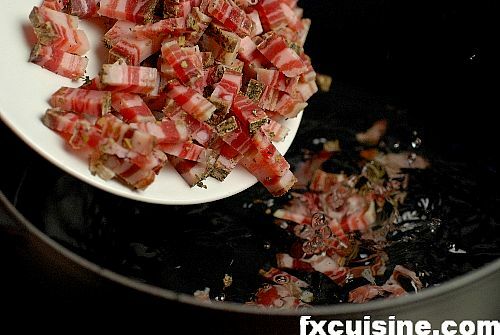 Ask the butcher to cut the trotters in half lengthwise and boil it in hot water for a couple minutes. Wash a clean cotton cloth under water until it does not reek of washing powder any longer. 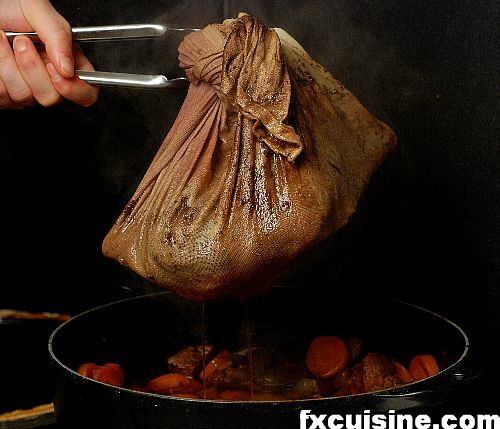 We'll use this bag to tie every flavoring ingredient that's not eaten - sprigs of thyme, peppercorns, cloves, bay leaves, sage leaves, parsley and the blanched trotters. This is much more elegant than having to fish them out before serving. There is much poetry in this bag and the evanescence of the ingredients who contribute to the show but are never seen by the guests. 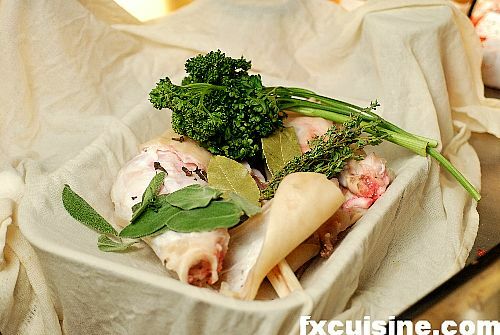 Braised dishes make use of lesser cuts which are very affordable. The long braising in my black cauldron turns these mundane cuts into delicious morsels like an alchemist who puts lead into his athanor and through a long process transforms it into gold. 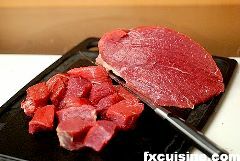 For this daube use beef blade, chuck or arm clod. Cut into large cubes. 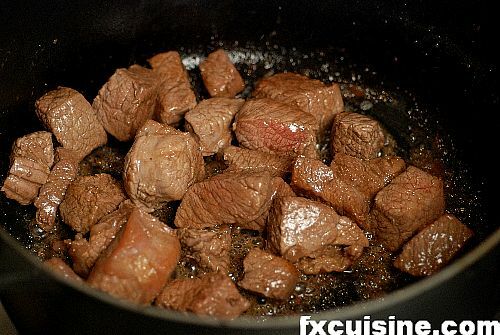 Sauté in a large pan with a little oil until browned all over. Reserve. 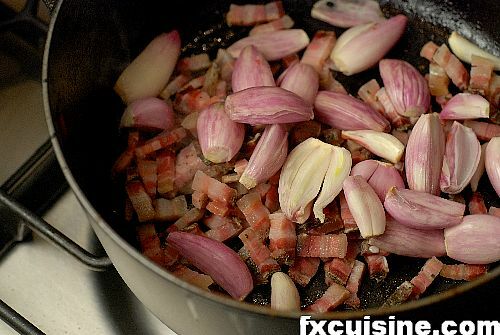 In a very large ovenproof pot sauté the blanched bacon and add the peeled shallots. 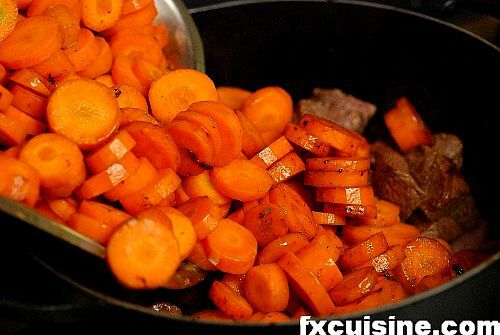 Peel the carrots and slice them 1.5cm thick. 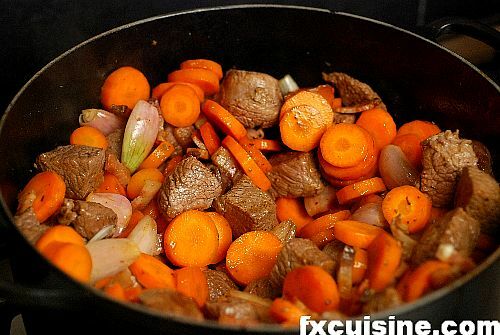 Sauté the carrots and then pour them into the pot whith the lardons, shallots and meat. 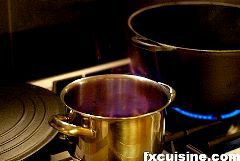 In a small saucepan heat the red wine and cognac until it boils, then light it up with a match. The alcohol will burn with a blue flame. 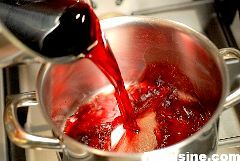 It may sound like defeating the purpose of adding cognac and good wine, but in fact alcohol has a strong taste that would ruin the delicate balance of flavors in the pot. It is best burnt off.